I’ve been asked recently to post my thoughts on the various cycles and aspects of our program to give a little more insight into the how’s and why’s, so here we go. The best place to start would be why do we use cycles. I’ve heard, “Why do I have to cycle? I’m not training for the games.” Easy answer is because a solid training program shouldn’t only be used by competitive level athletes. To use a haphazard approach is leaving money on the table. Controlling the program with planned variation at intervals where the adaptation (improvement) from the stimulus (training) diminishes is the best plan for building better fitness for both the short term and long term (fastest gains in shortest period of time, sustainable for months/years). Using Wendler’s 5-3-1, the Hatch Squat Program, or Starting Strength’s 3×5’s as the strength portion of your workout is not a “cycle”, it’s a novelty. The entire program should be structured within a cycle to work towards a common goal, conditioning and accessory work included. This is true for beginners and advanced athletes. What this cycle is all about. Building strength is a structural and neurological change, the wrench in the gears is that the rate of change varies for different tissues. Neurological changes can happen very quickly, muscle growth and repair is a fairly quick process, connective tissue however is not. We have to account for the increase in muscular strength and the disproportionate strength increase of the supporting connective tissue. Without taking that into account and halting a strength biased program at the right time, increased risk of injury is a danger. Without planning ahead of time for the varying needs of the system (your body) you’re leaving too many variables and hoping for the best. God speed crash test dummy. The fun part is in the details, the seemingly inconspicuous aspects of the program are where the magic is. Increasing strength increases absolute force production, greater force production allows us to do cooler things, strict pull ups, handstand push ups, higher jumps etc. If you combine force and speed, now you’ve got a great combination. Power is the name of the game. Whether it’s football or Crossfit, the more powerful athlete will win. Transitioning from a strength based cycle to a volume cycle doesn’t mean no more heavy weights, as you probably noticed. What it means is changing how we use the weight to affect the system. In this cycle we use the weight to increase power production, meaning we want to use heavy weights and move them faster. This has many benefits to performance, including increasing maximal force production (stronger), but the sneaky detail that is easy to overlook is the benefit to connective tissue which responds well to high volume work at moderate to heavy weight. Exactly what this cycle is all about. 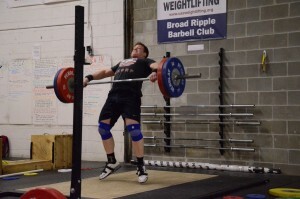 Allowing the connective tissue to get stronger to match muscular strength and increasing power output are key components of this cycle, and necessitate varying cycles whether you are a beginner looking to get stronger and faster or a competitive level athlete hoping to compete with the best. Enjoy this cycle, I’ve had many a chuckle while writing it out.